This is Milani Lip Flash Full Coverage Shimmer Gloss Pencil in Hot Flash 05. I bought mine from Cherry Culture sometime last year. This pencil is on the thick side and quite soft. It applies very smoothly and evenly but cos of the size I have hard time trying to use it as lip liner too. So for sharp looking result I like to either use a lip liner pencil or apply Lip Flash with a brush for the finishing touch. 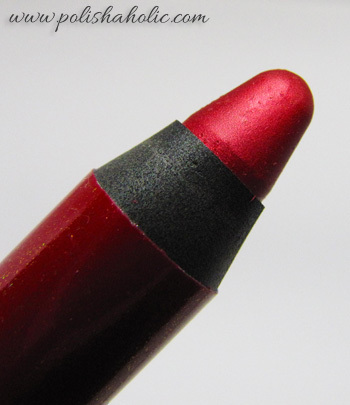 Hot Flash is highly pigmented and has visible shimmer in it. It is creamy and doesn’t feel dry on my lips. It’s also surprisingly long lasting through eating and drinking. It wears off pretty nicely leaving a hint of shimmer and redness on your lips. I love this deep, bold, metallic shade! Great product for the price! I’ll be back later today with a nail post. My first TIOT :) Check back later to find out what that is about!